The two weeks after my birthday were more of the same—the same, if you recall, being stomach aches, extremely low appetite, fatigue, and nausea. Things finally changed on June 10! Naturally, these things always happen over the weekend. I had asked the EMTs to take me to MedStar Montgomery in Olney, which is where I get my chemo and where my oncology team has a satellite office. But since the likely culprit was the stent I got in March, and since an endoscopy was the recommended next course of action, the Olney docs decided to ship me down to Georgetown University Hospital. There, the same doctor who put in the stent would be able to perform the endoscopy and figure out what to do about the stent. But not until Monday, of course. Meanwhile, I was having ever more difficulty eating. In a repeat of March's stay, I was put on IV nutrition. And although the nausea and vomiting hadn't recurred, every stool sample was full of blood. When I finally got an endoscopy, it revealed that the tissue surrounding my stent was actually pushing through the stent itself. (Possible because the stent is made of a mesh in order to allow expansion.) As you can imagine, said tissue was inflamed (causing abdominal pain) and bleeding (hence the hematic vomit and stool). My pharmacopoeia also expanded to include non-chemo drugs with the aim of soothing the inflamed tissue. If the chemo succeeds, whatever is pushing the tissue through the stent should cease. While waiting for the Gemcitabine/Abraxane duet to be effective, pantoprazole and sucralfate provide some immediate relief by blocking stomach acids and enzymes. Once I proved able to tolerate semi-solid food, I was allowed to escape into the blissfully scorching summer DC heat. I say “blissful” because every hospital room I've been in over the past year has its air directly pumped in from the North Pole. I feel the cold more than usual these days, and wearing a flimsy gown that is open in the back doesn't exactly help. But I digress. Being home again was, of course, a vast improvement. But the internal bleeding continued, to the point where I was getting one or two blood transfusions a week. Naturally, being that low on blood introduced me to new levels of fatigue (see anemia). My pain medication was decreasingly effective, and eating was an ordeal that just exacerbated the abdominal torment. My weight plunged to a new low of 55 kg because meals consisted of just the few bites I could force down. Some days I could function for a while, some days I was bedridden. The one-year anniversary of my diagnosis was approaching. In morbid bouts of introspection, I thought: This is how the body prepares the mind for the impending finality of cancer. The body breaks down piece by piece, each failure adding more pain and discomfort, until the mind welcomes release. Nevertheless, my calendar is booked for the foreseeable future. Bridge tournaments over the summer, wedding vow renewals in September, a new Treasure Hunt in October… So the search for solutions continued. First up: better pain management. My oncologist authorized doubling the strength of both my fentanyl and oxycodone, which made a huge difference in my personal comfort at the expense of adding to the national opioid epidemic. The next issue was feeding. Since eating was still painful, we decided to try a radical approach—a return to IV nutrition, as in the hospital. While in theory I could get infusion through my PowerPort, the oncology team wanted to keep that clear for chemo. So I got a dual PICC line installed, with one lumen dedicated to receiving infusions of IV nutrition (known as TPN). I've been on TPN for five days now. Eventually, I'll get a full RDA of about 2,000 calories through IV. After starting on 1,200 calories, I'm moving up to 1,570 calories tonight. The TPN bag also includes vitamins, dextrose, and all I need for a healthy balanced diet. Yum, yum! 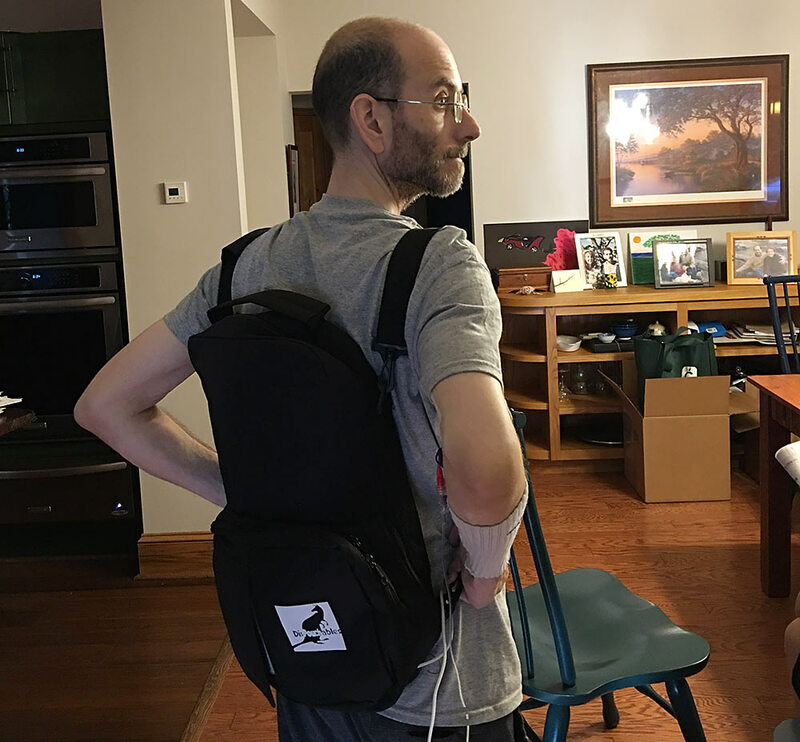 As captured by the Mad Scientist picture at the start of this post, I'm responsible for injecting the vitamins into the nutrition bag, setting up the pump, and connecting the bag to my PICC line. Of course, I still need to eat some normal food to make up the missing calories. I'm happy to report that eating has gotten easier with the new pain meds. In fact, all my stomach pain has improved greatly. No more vomiting. And the internal bleeding seems to have stopped—no trace of blood for more than three days now. My last blood transfusion was nearly a week ago. I'm still more tired than usual, and some days remain better than others. But for the most part, the past few days have been markedly superior to the previous months. Whew! Sorry for the length. Now if you'll excuse me, I have a bridge tournament to prepare for. Happy 4th of July, everyone. You're at the end of this series. Thanks for reading! Your Dad & Mom were high school classmates, so the entire Grant family were dear friends as early as 1963. My wife & I now live in North Chevy Chase and I see Steve mostly for gentlemens' poker evenings. Your folks have shared your web page and I have been following your brave journey now for over a year. Our hearts are with you Elliot. While you have been battling a raging current, we have been out of the area quite often during the past 12 months attending to three family elder care situations of 94, 88 and 75-a mother-in-law, aunt & sister. We are happy to work to alleviate their fears and are cheer for them to believe in the future ahead. And we are also thinking of you & your entire family Elliot, while browsing your most incredible etgdesign page, thinking of your courage spelled out in the service of others. I hope to add another note to you within the next week Elliot. Eventually, I would like to share in some of your many interests too, from Bill & Lyllian Grant to bridge and beyond of your wonderful wife and boys. Hi Steve, and thank you for such a heartfelt message! It's wonderful that your friendship has endured for so long—definitely an inspiration to us all. Hope our paths will cross sometime so I can get to know you in person. Thinking of you as you go through all these ups and downs. Sending a big hug from all of us! May this new month be better for you. I think of you quite often and had a good chat with your mom a short while ago. In the past year and a quarter since your diagnosis I have been very happy to learn about your many accomplishments and good experiences. I also know something of your trials and feel justified in proclaiming you a Champion Survivor! You have inspired me with your success as you continue to meet so many of the goals you have set since this thing began. I hope it warms your heart to see how your courageous love has helped your family, certainly your mom and dad. In spite of many extreme challenges, I believe you continue to build the strength and courage of your family and others with your fierce handling of this disease. Congratulations on all you have done and all those future goals you have set. You know Elliot, what you are going through isn’t fair. But you would probably agree with me that anyone looking for fairness in this life is shopping in the wrong store. No, pancreatic cancer isn't fair. I saw a headline recently noting that nearly half of cancer diagnoses are preventable (related to lifestyle choices). Of course, that only means more than half are unpreventable. When it comes to evolution the mutations giveth, and the mutations taketh away. I think we both know what makes it all worthwhile: a perfect autumn day, ice cream, a captivating book, the view from the Grand Canyon, good music… and above all, the love of a fellow human spirit.